#culinarycollectiveny chefs @jayastafa + @lalasgotnext making liquid nitrogen caramel popcorn! The doorway at the Culinary Collective’s weeknight supper was unmarked when I walked up to the Clinton Hill brownstone last week. The neighbors were enjoying the season’s first stoop beers and the only clue indicating the dinner party upstairs was a couple of well-dressed men looking similarly lost. The ambiguity stopped there: once we entered chef Angela Lowe’s apartment, we were greeted by a busy open kitchen and two separate dining areas that lent new definition to the term “maximizing space.” The 7-course all-vegan dinner started with a riff on sloppy joes and ended with strawberry cheesecake. The playful vibe continued throughout the meal with edible dirt and liquid nitrogen caramel popcorn. 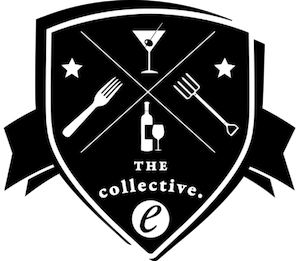 The Culinary Collective, a series of tasting menus held in Angela’s apartment, was born of a mutual interest in elevating vegan cuisine. Chefs Jay Astafa and Angela Lowe met through the Natural Gourmet Institute. Angela came to culinary school from a fashion career where she ran her own company, and 22-year-old Jay had recently veganized his father’s Long Island pizza cafe. Both students of the Institute’s vegan track, Angela reached out to Jay after hearing about his approach. They became fast friends. “We have the same personality and we also have the same approach to food — that is, not letting it take itself too seriously,” Angela laughs. The chefs shared the dream of crafting high-end vegan food with innovative techniques. “We’re trying to apply a high level of elegance to vegetable-forward food,” they agree, adding that while New York has a lot of great vegan food, it’s not on a highly progressive level. Their tasting menu model, which they’ve adapted for 7- and 15-course meals (although ours was inexplicably 11.5), spans from an opening amuse bouche to a tongue-in-cheek cheese course followed by dessert. Last week’s taste of spring featured vegan spins on parmesan, horseradish crème fraîche, vichyssoise and two types of “bacon” (eggplant and shiitake). When asked what it’s like to work together in a tiny apartment kitchen to feed upwards of twenty guests, Angela admits that they’ve been “losing their minds in the most hilarious ways.” But at the end of the day they both understand their strengths and weaknesses. “The funniest challenge is just that my house is a restaurant, I mean, my cats are locked in the bedroom,” Angela said. Joking aside, a tasting menu in an apartment kitchen is no small feat: they have to use fridge space at Jay’s dad’s restaurant and a massive overflowing cooler stands in for a walk-in during service. While the Culinary Collective is on track to grow out of Angela’s apartment — they’re headed on a tour of the West Coast and they plan a weeklong pop-up restaurant this summer — they envision it more as a series of collaborations than a permanent restaurant. The chefs have a prolonged vision for the project and hope to soon invite guest chefs into the kitchen. For now, they’re continuing to collaborate with like-minded partners — Wednesday’s Earth Day dinner is a partnership with the Salvage Supperclub. They’ll be donating a portion of ticket sales to City Harvest and using ingredients like carrot tops and broccoli stems. Jay and Angela make a great team in the kitchen, but their career aspirations may ultimately drive them apart: Jay hopes to have his own restaurant and already operates his own catering company, and Angela is starting a self-produced YouTube series that explores food and travel. “It won’t necessarily be exclusively vegan… but it’s about finding out what brings people around a table.” She’s hoping to veganize some of the most exciting dishes she finds along the way, with Seattle, San Francisco, L.A., Brazil and Dubai on the itinerary. But for now, you can find them dipping caramel popcorn in liquid nitrogen and carefully plating edible dirt and flowers in Angela’s Clinton Hill apartment. Be sure to slip some leftover shiitake bacon to her exiled cats.